Players must stand with at least one foot on a rubber mat, when delivering their bowl. The mat is placed on the centre line of the rink and is lined up by following instructions from the skip or marker. The lead player who is to deliver the Jack determines how far up the rink the mat is placed. The first player, the “lead,” delivers the Jack. The jack must be rolled at least 23 metres from the front of the mat, otherwise it’s returned and rolled by the other team. The Jack must be centred on the rink while keeping it at the same distance from the mat. If it stops too close to the ditch at the end of the rink, it has to be moved two metres from the end. If it rolls into the ditch, then it is returned for the other team to roll. In the event of both teams failing to deliver a legal jack it is placed two metres from the end of the rink. The lead then bowls their first bowl and tries to get close to the jack. Players then alternate until all the bowls have been played and the “end” is completed. The order in which players on a team play is determined before the start of the match. After all of the bowls have been played, the number of “shots” is counted, marked on a score card, and the next end commences. A team gets 1 point for each of its bowls closer to the Jack than the nearest opponent’s bowl. Once the score has been agreed, all players help in collecting up the bowls ready for the next end to begin. The team that scores in the “end” delivers the jack in the next end. Games can be played to a fixed number of “ends”, or to a minimum number of points. The jack can be moved during play by being hit with a bowl. The jack remains in its new position. A “toucher” is a bowl thats hits the jack during it’s initial delivery. a bowl that is subsequently knocked onto the jack is not a toucher. Touchers are marked with chalk (being careful not to move them) and remain “live” even if they are subsequently knocked into the ditch at the end of the rink. The end is “dead” and is usually replayed, if the jack is knocked outside either side of the rink. 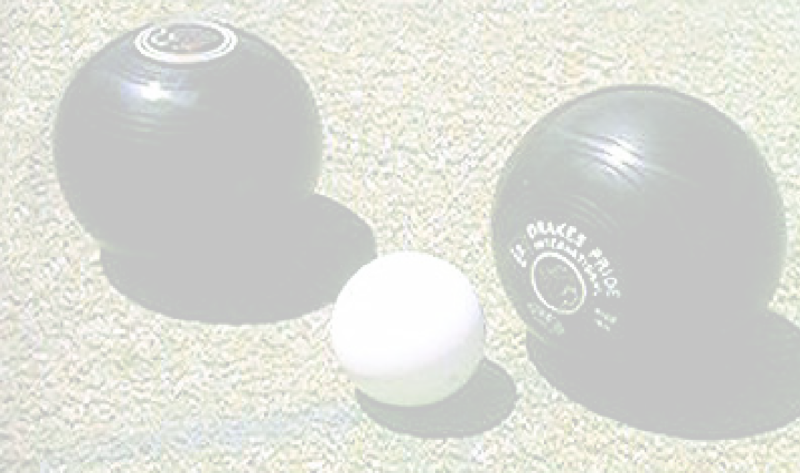 Bowls which stop outside the edges of the rink are also “dead” and should be removed. If the jack is knocked into the ditch it is still live providing it is within the confines of the rink. Bowlers then have to try to get as close to the jack as possible without falling into the ditch. Bowls which are falling into the ditch should be stopped before they hit the jack or any “live” bowls already in the ditch. If the bowl has been delivered on a wrong bias, then stop it. If it is the correct bias and is only likely to hit one of your rinks bowls before returning to its own rink, you should lift your bowl to allow the bowl to pass under it. You should then replace your bowl in its original position. If the bowl entering your rink is likely to disturb the “head”, then you must stop it. Different shots can be played, either forehand or backhand depending on the situation in the head. The player attempts to deliver his bowl as close as possible to the Jack. This shot is delivered with more force than the Yard On to knock an opponents bowl away from the jack, or one of your own previous attempts closer to the jack. This shot is delivered with a lot of force, the object being to completely remove an opponent’s bowl from the rink, drive the Jack into the ditch, or “shuffle the pack” if in a losing position.